Downtown is exploding. There’s so much construction going on I can’t even keep track of it. Massive new office and residential buildings are springing up all over the place. There are also efforts underway to revitalize a number of older buildings. Some of this stuff is cool, some of it is dumb, but I’m less concerned about the quality of the individual projects than I am with the cumulative impact of all this construction. More on that later. Let’s start by sampling a few of the projects currently under construction…. This is the Blossom Plaza, which combines retail and residential, including a fair number of affordable units. It took years for this to get off the ground, and there was a recent hitch when workers uncovered remnants of the original Zanja Madre, but things are moving forward. Curbed LA has been following the story for a while, and you can read more about it by clicking here. I had a harder time finding current info about this project. The most recent report I read said this was a 240 unit complex being developed by the Irvine-based Sares-Regis Group. Whatever it is, it looks like it’s going to be huge. 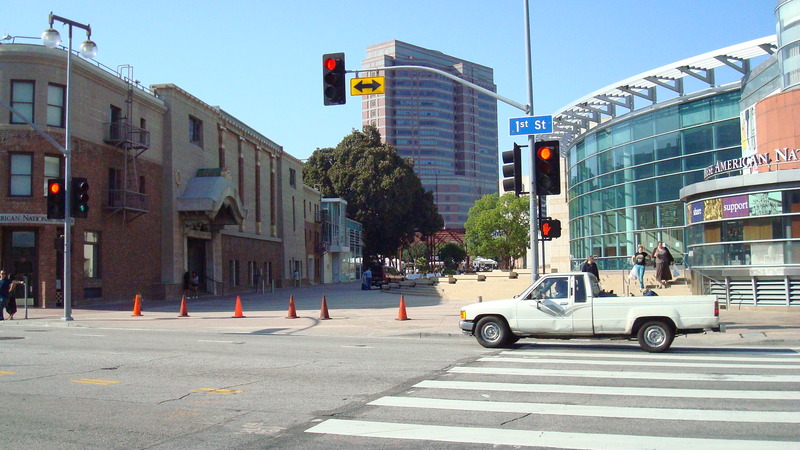 The site is located at Second and San Pedro, right next to…. 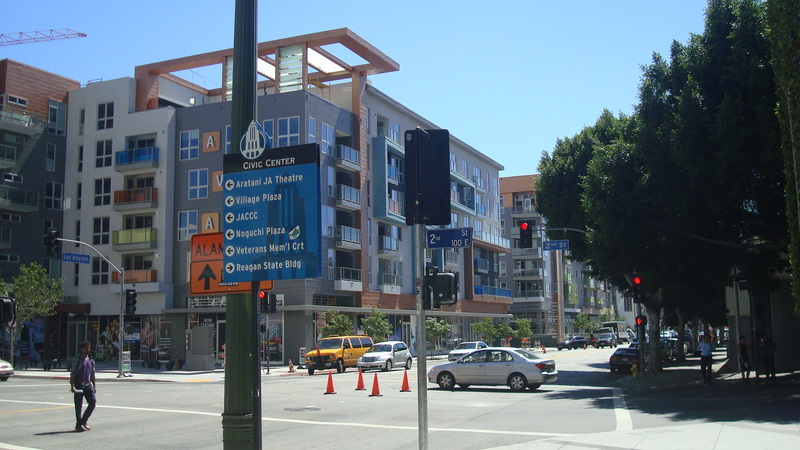 ….the recently completed AVA Little Tokyo, another massive mixed-use structure. 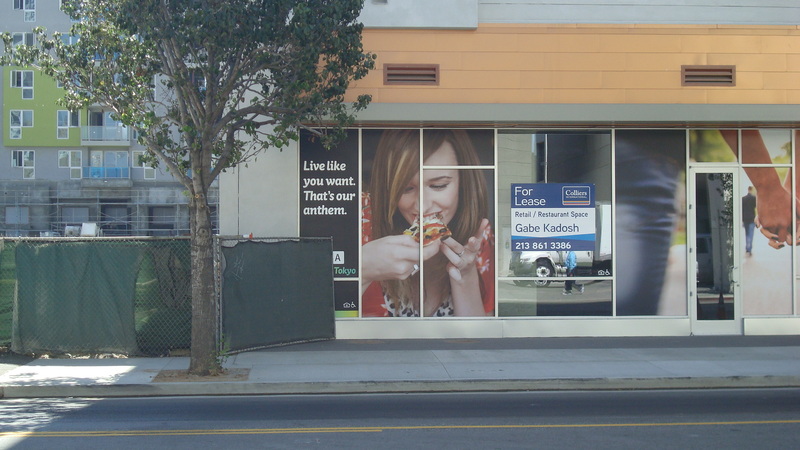 Apparently young people are flocking to Downtown LA these days, and developers are doing everything they can to capture that crowd. Check out this ad, seen in one of the windows on the ground floor. And since we don’t have enough luxury rental units in Downtown LA already, Carmel Partners has generously agreed to build 700 more. As you can see in the photo below, it’ll be a while before the project is complete. You may want to put a deposit down soon. Given the list of amenities, I don’t doubt that the Eighth & Grand complex will be popular. I was sold when I heard about the rooftop pool surrounded by cabanas. For more details, click here. But let’s talk about a project that might actually benefit the people of Los Angeles. 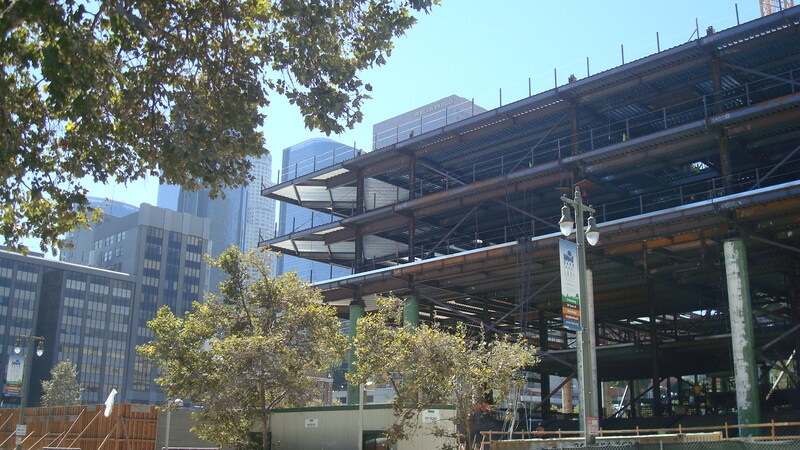 Here’s the new federal courthouse, which is finally going up after being delayed for years. The courthouse is just one component in a larger scheme to revitalize this part of the civic center. 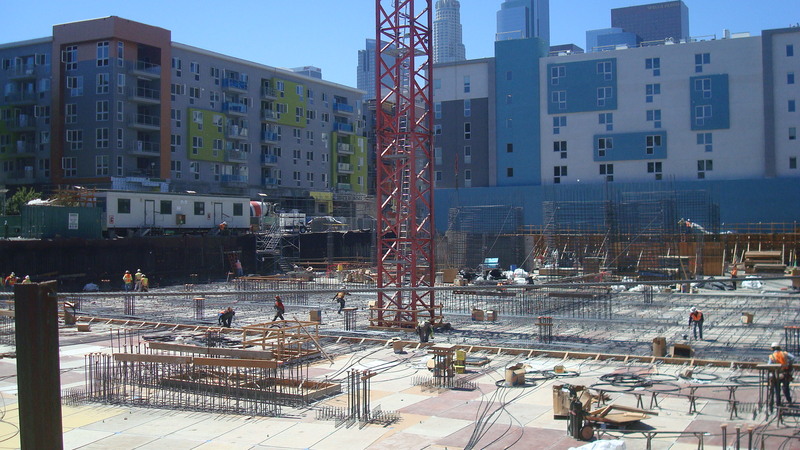 Building Los Angeles offers a rundown on some of the related efforts. 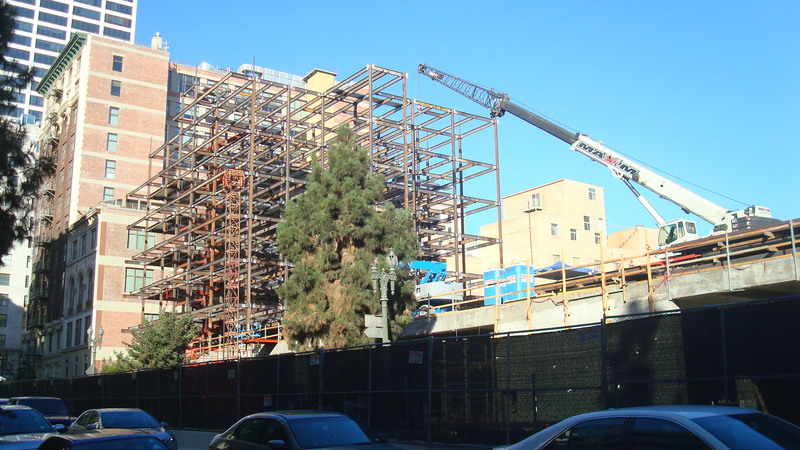 Honestly, of all the projects under construction in Downtown LA, the only one I can really get excited about is The Broad. 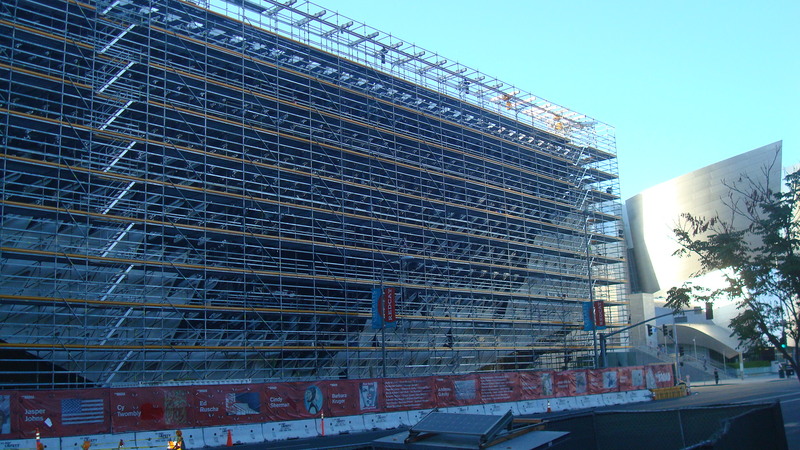 It’s still a long way from completion, and the web site just says that it will open in 2015. But it’s something to look forward to. And they’re already doing some cool programming. Click here to find out what’s going on. 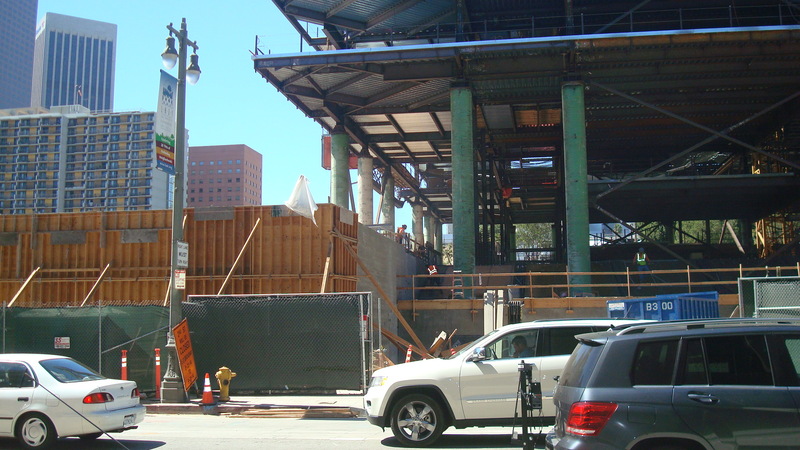 And let’s wrap it up with the New Wilshire Grand. It’s said that when the project is completed, this will be the tallest building west of the Mississippi. Who cares? I’m so tired of this kind of development. Does this really have anything to do with making the city a better place to live? Or is it just another monument to greed and vanity? 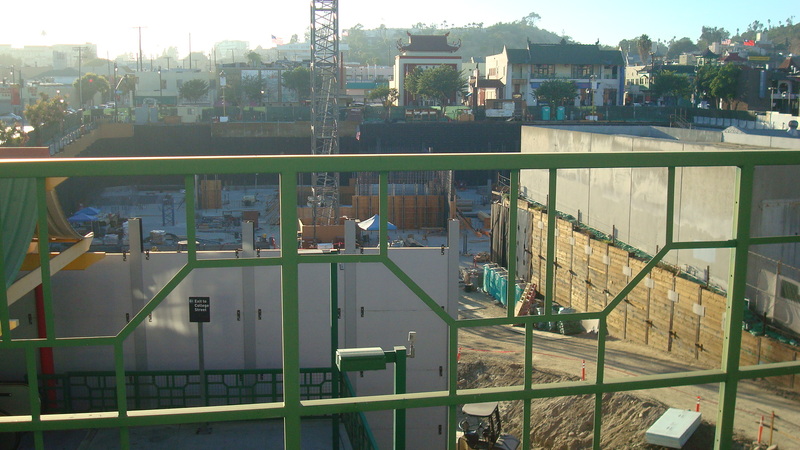 There’s a lot of talk right now about how LA has to embrace higher density development. Fine. There are good reasons to create a more compact city, and certainly sprawl has been a major problem throughout our history. But can anybody demonstrate a need for skyscrapers of this size? And looking at the bigger picture, do we really have the infrastructure to support development on this scale? I’m thinking especially of water, since we are in the middle of a drought. The projects I’ve highlighted here are just a few of the dozens that are either currently under construction or in the permitting process. 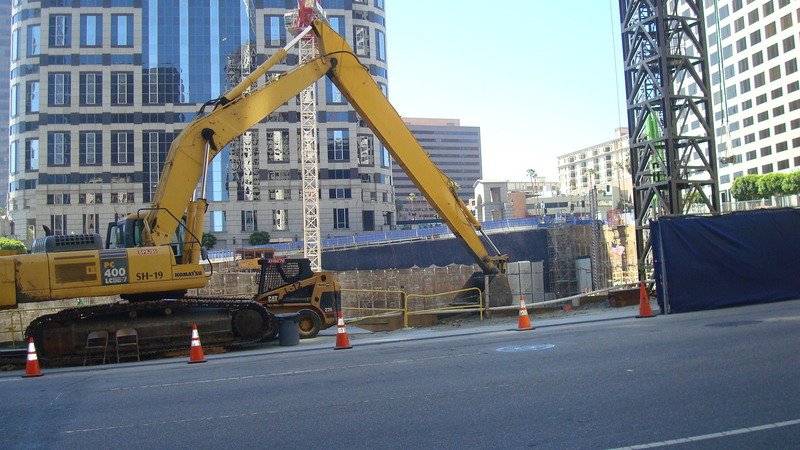 When I look at the avalanche of development that’s hitting Downtown LA, I have to ask if anybody at City Hall is thinking about the future, because I don’t see any evidence of rational planning. Instead, I see an onslaught of construction driven by developers who are falling all over themselves to get in on the gold rush. I really question whether the Mayor or the City Council have given any serious thought to how this massive growth spree is going to affect LA down the road. I wish I could believe they were really concerned about the well-being of the people of Los Angeles. It seems more likely that their chief concern is keeping their developer buddies happy. As many people have pointed out, LA is different than most major cities. New York, Chicago, and San Francisco all have suburbs surrounding them, but people still go downtown for work, shopping, entertainment. Years ago that was also true of LA. When I was a kid my dad worked downtown, and we went there regularly for one reason or another. But over time the suburbs kept spreading farther outward, and many of them gradually became self-contained communities. 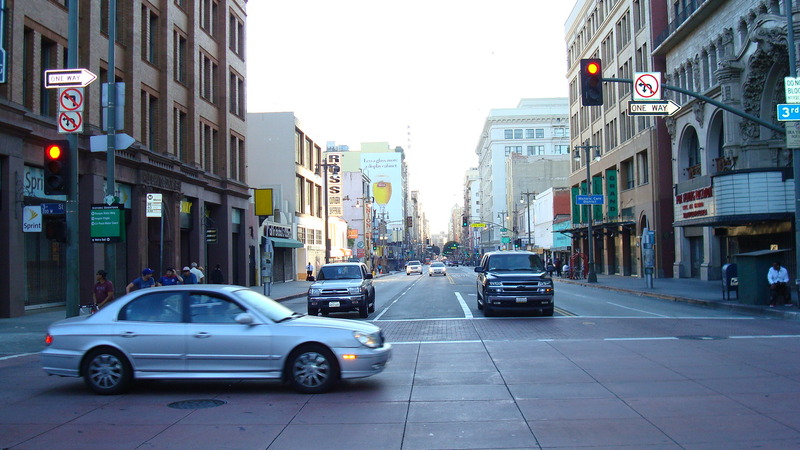 There are a lot of people who live in LA who have never been downtown. What’s more, they don’t ever want to go there. I love downtown LA. I go there often. Last month I made a couple trips downtown with a camera. What follows is a record of my ramble through the city center. So if you’re too busy or too tired or too scared to make the trip yourself, this will give you a taste of what you’re missing. I started by taking the subway to Union Station. 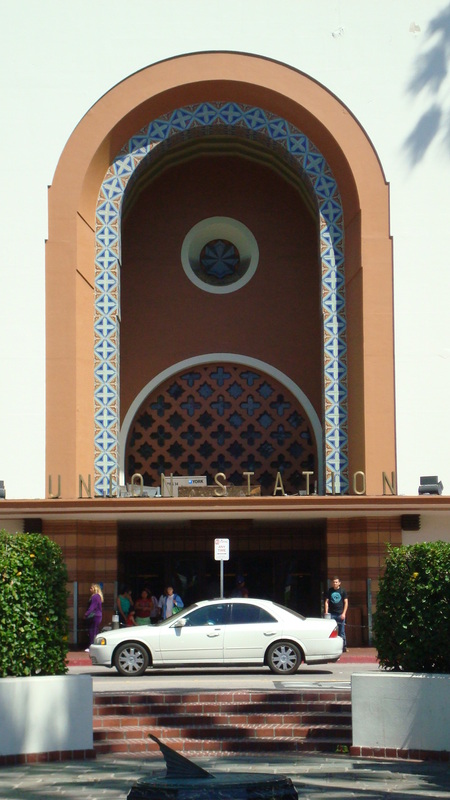 The photo above shows the main entrance. I was hoping to include a link with photos of the interior, but I couldn’t find a single site that did it justice. You can, however, just search for images of Union Station. There are many of them on the net. Trust me, it’s worth taking a look. 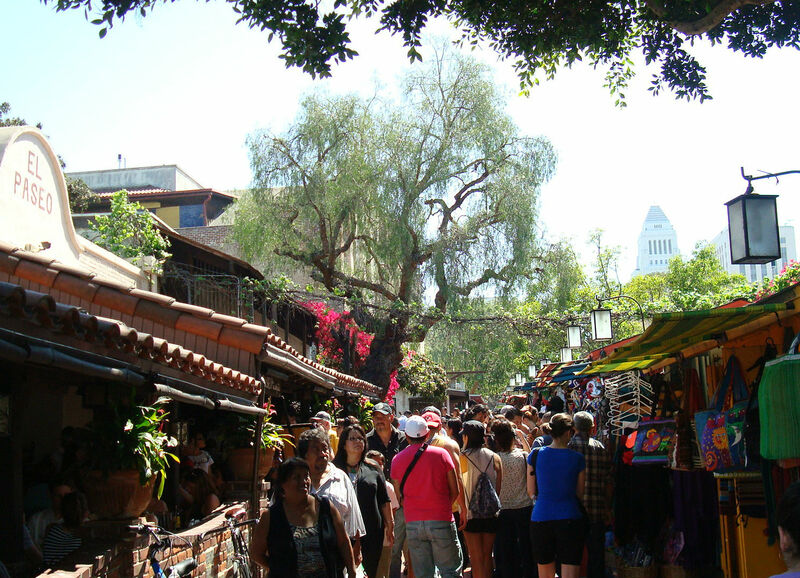 Right across from Union Station is Olvera Street. Sure, it’s a tourist trap, but it’s the coolest tourist trap I know of. You may have to fight your way through the crowd, but there are some restaurants that are worth the trouble. And it’s part of the historic core of LA. Among other things, you’ll find the Avila Adobe, the oldest building in the city. 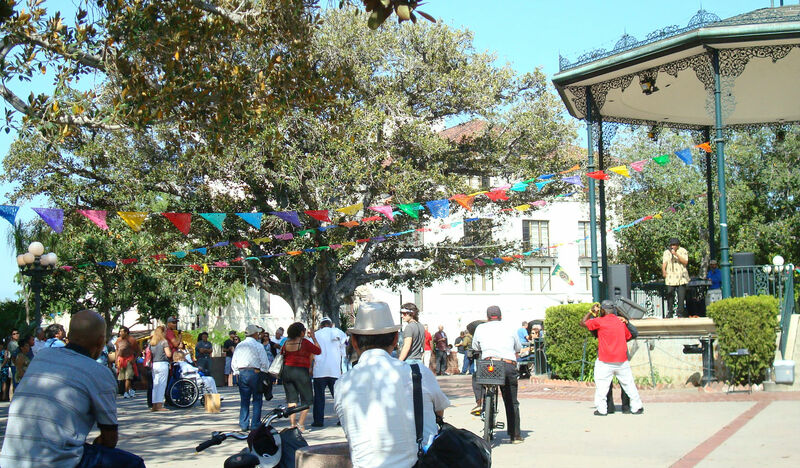 Right next door to Olvera Street is the plaza that sits at the center of El Pueblo de Los Angeles, a state historic park. The plaza is surrounded by a number buildings that date back to the nineteenth century, when this was the center of activity in the city. 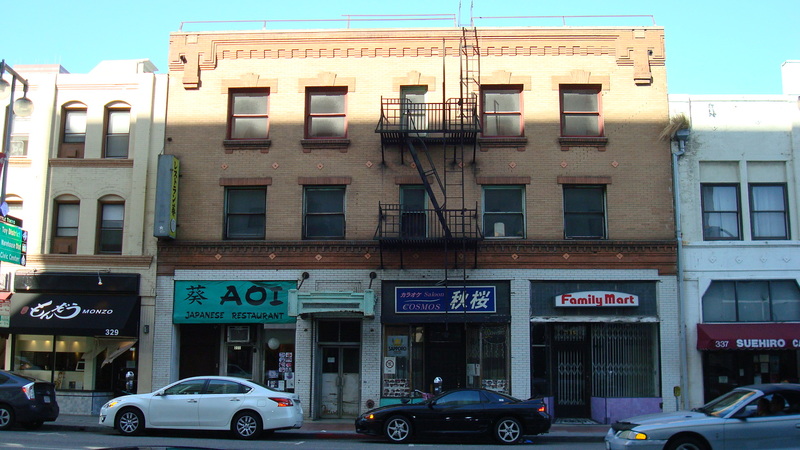 It won’t surprise you to learn that Chinatown got its name because it was home to a large Chinese community. These days, though, the name may be misleading since the area seems to be mostly drawing immigrants from Vietnam and Thailand. 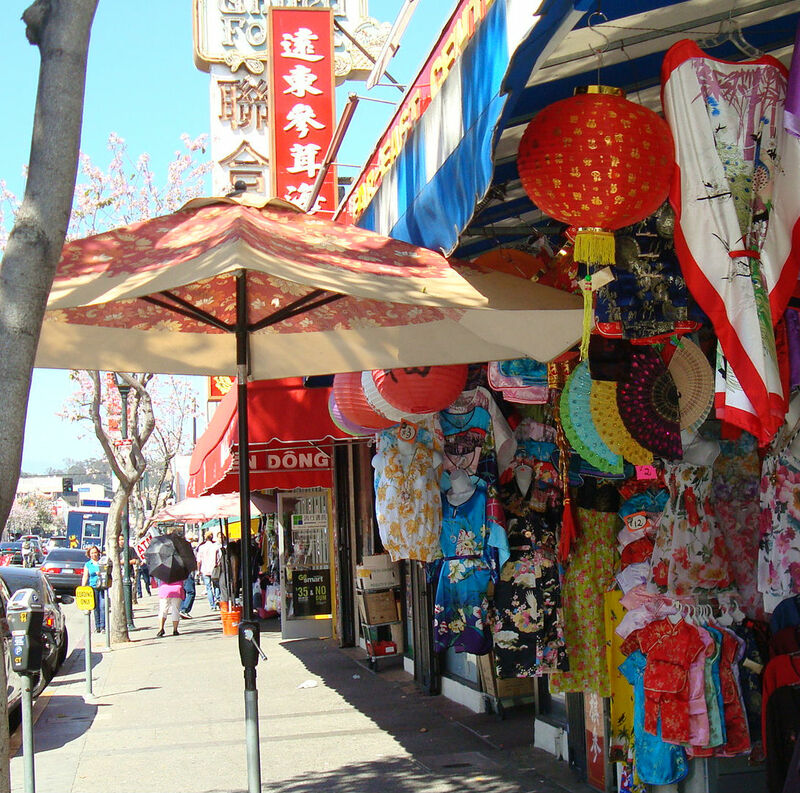 Now the largest Chinese communities are located in the San Gabriel Valley. Walking along Broadway, I have to say my impression was that the area is past its prime, but I see that some interesting events are taking place there in the next few months. Maybe I just caught Chinatown on a slow day. 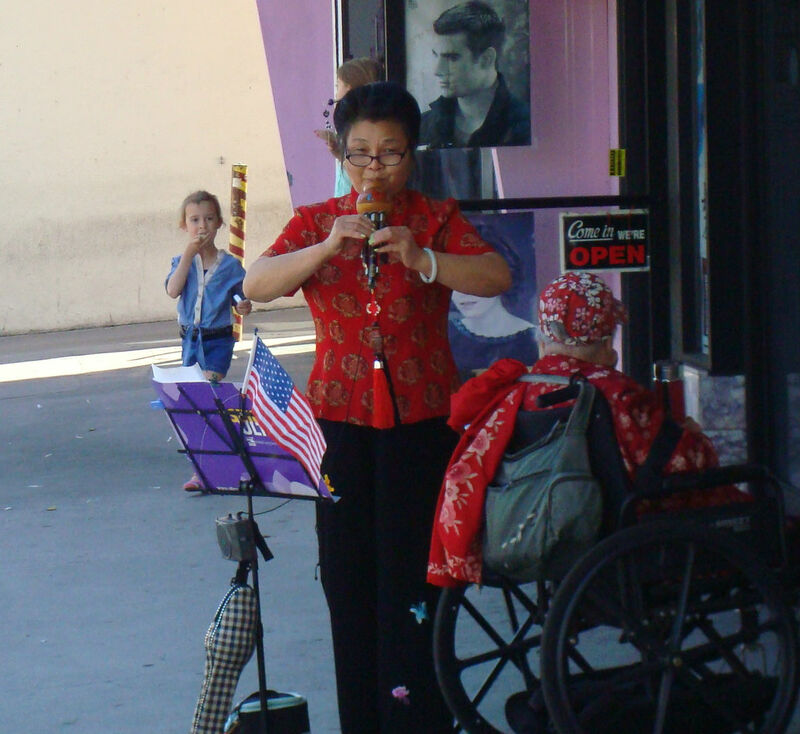 This is an image of a woman playing traditional Chinese music. I passed another street musician, an older man, singing songs that sounded like they must have come from the old country. Sadly, these people are part of a dwindling minority. My impression is that even in China traditional music is quickly being forgotten as people rush to embrace pop, rap and techno. It’s frightening how Western pop culture buries everything it can’t market. When this older generation dies off, will there be anyone left to sing the old songs? 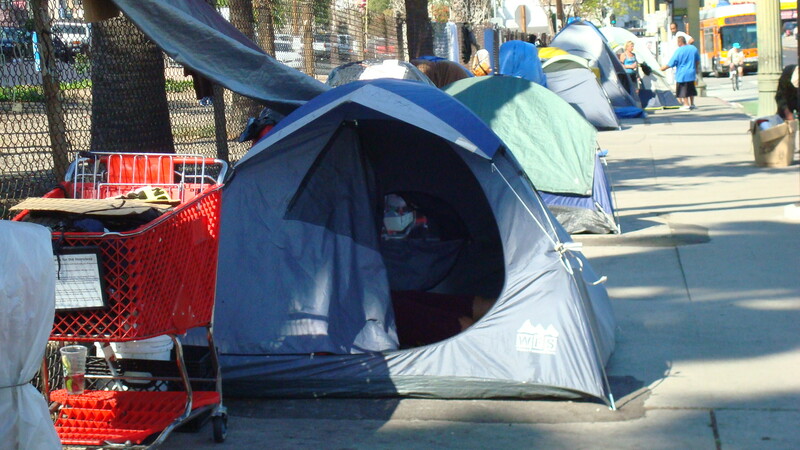 A tent settlement on Spring Street. 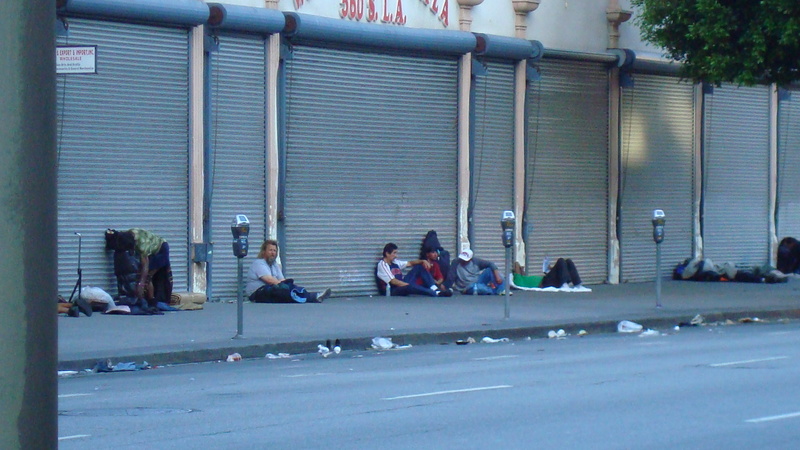 Homelessness continues to be a problem all over LA. Little Tokyo is one of my favorite places to go, partly for the food, but I also just like the vibe. This is a row of shops and restaurants along First Street. And just around the corner…. ….is the Japanese American National Museum. The building on the left is the historic older building which I believe houses the museum’s offices. The newer building on the right is the exhibition space, and I have seen some very cool shows there. As I was walking down Second, I looked up and saw St. Vibiana. It’s one of the oldest buildings in the city, and we’re lucky it’s still standing. 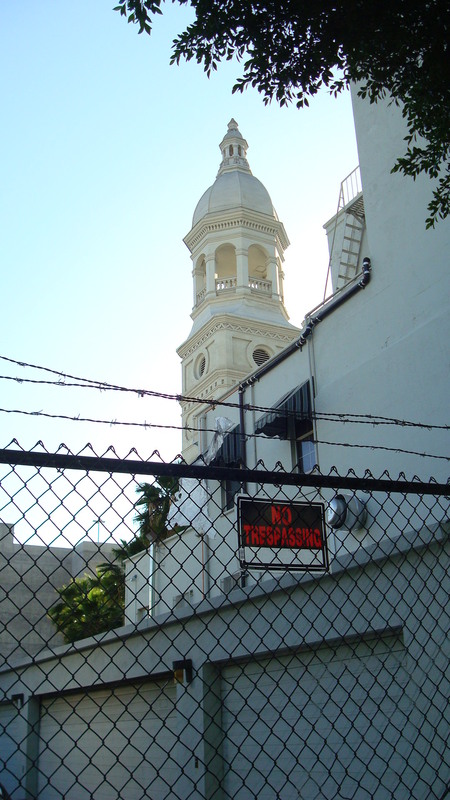 During the nineties, the Archdiocese made a deal with the City of LA to tear the cathedral down. The process was stopped by preservationists, who managed to get a court order which halted the demolition. Today it serves as a performing arts center and event venue. I was walking down Broadway and passed this doorway and it caught my eye. 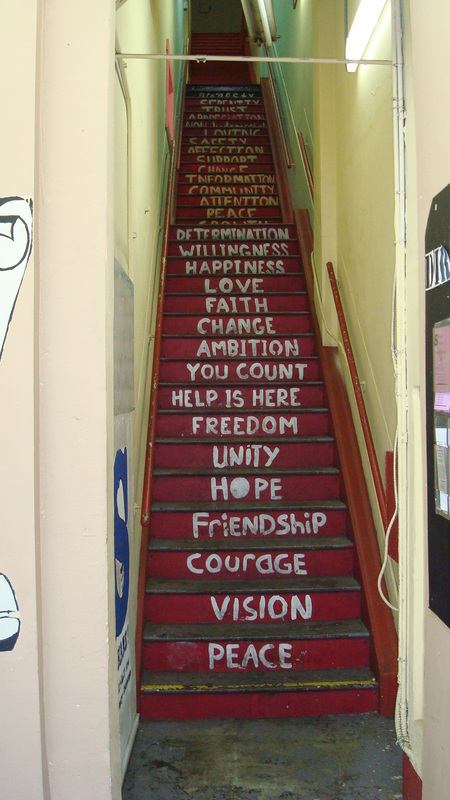 The stairs lead up to an organization called SHARE! which provides services for people dealing with a variety of issues. I looked up their web site and found this. SHARE! empowers people to change their own lives and provides them a loving, safe, non-judgmental place where they can find community, information and support. Walking through some parts of downtown there is definitely a sense of desperation. While gentrification is rapidly turning some neighborhoods into upscale enclaves, just around the corner you’ll find people living in total despair. I guess happening across this stairway I felt like I’d found an unexpected message of hope. I fell in love with the Bradbury Building years ago, and I try to visit it whenever I can. It has been standing at the corner of Third and Broadway since the end of the nineteenth century. The interior is gorgeous, but unfortunately these days only people who have business with one of the tenants can go above the first floor. The Bradbury Building was designed by George Wyman, and the story of how he got the job is pretty unusual. To learn more about how it was created, and to get a glimpse of the inside, click here. 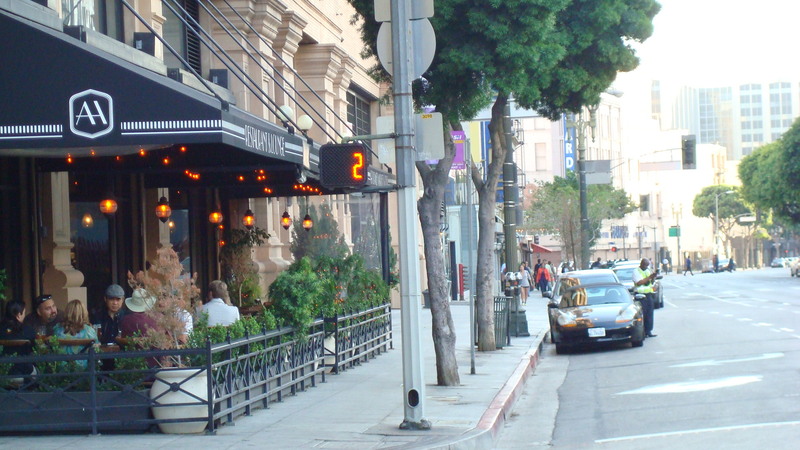 Broadway used to be the original theatre district in LA. 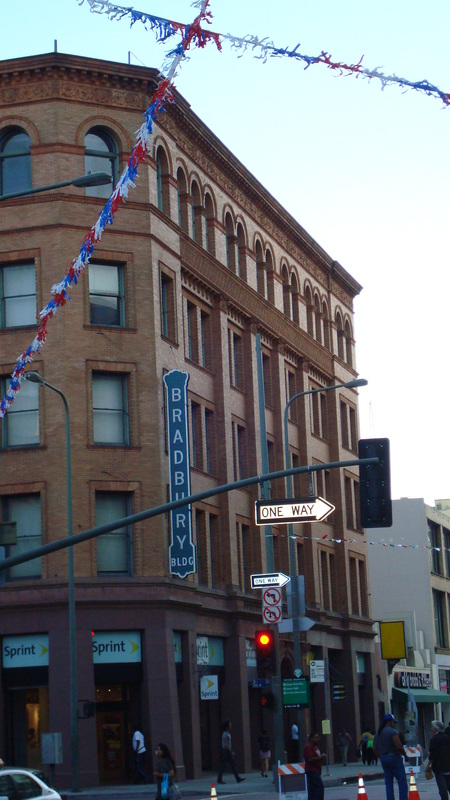 In the photo below, the Bradbury Building is on the left, and on the right hand side you can see the Million Dollar Theater, which is where Sid Grauman set up shop when he first came to LA back in nineteen eighteen. Grauman didn’t stay on Broadway long. In a couple of years he moved to Hollywood, where he first built the Egyptian and then the Chinese. Farther down Broadway you’ll find the Los Angeles Theatre. This spectacularly gaudy movie palace was designed by S. Charles Lee, who designed many other theatres during his career. The first film to play there was City Lights. I’ve been inside only once, years ago, and I have to say it was pretty amazing. The lobby alone was worth the price of admission. Unfortunately, it’s only open for special screenings these days, but if you get the chance I urge you to check it out. 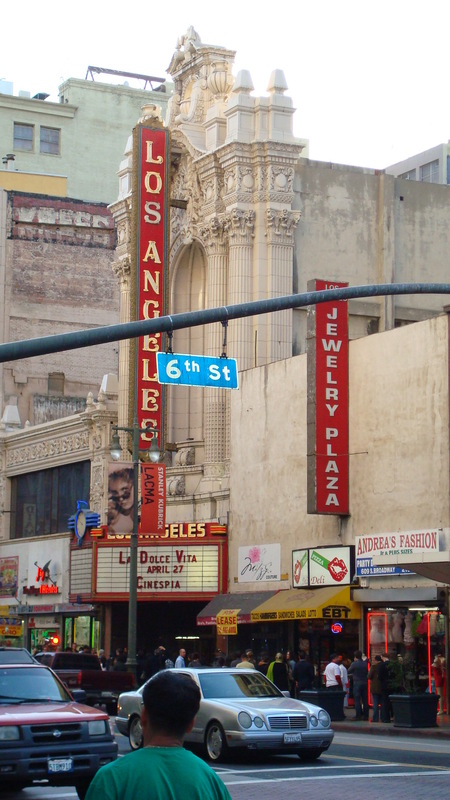 The Los Angeles Conservancy sponsors a series every summer called The Last Remaining Seats, during which they show films at some of the old movie palaces. The bad news is that this year’s screening of All About Eve at the Los Angeles Theatre is sold out. But you can check out photos of the interior on the theatre’s web site. Use the menu on the left to see images of the lobby, auditorium, etc.. This was taken at the corner of Sixth and Main. Upscale restaurants seem to be proliferating rapidly downtown. Meanwhile there are still plenty of people who can’t even afford a cup of coffee. These folks don’t even have tents. The Music Center is another mid-century classic by Welton Becket and Associates. 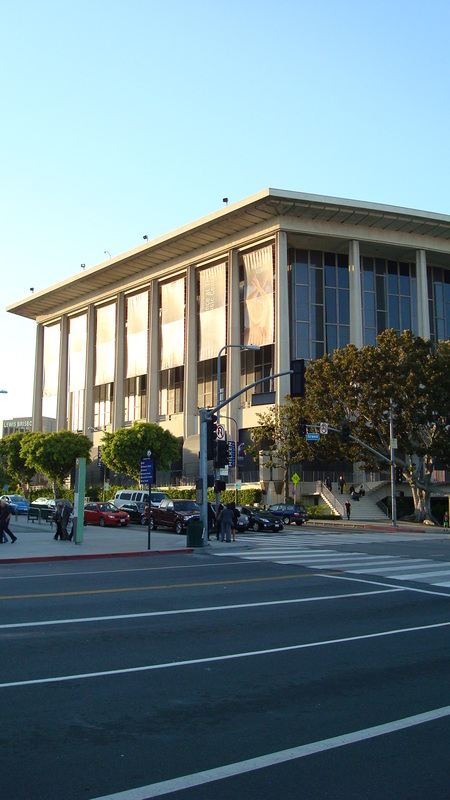 It’s comprised of the Dorothy Chandler Pavilion, the Ahmanson Theatre and the Mark Taper Forum, and was completed in nineteen sixty seven. Becket believed in “total design”, meaning that he encouraged his clients to have the firm create not only the structure, but also furniture, carpeting, signage, dishes and flatware. Originally the Music Center did have an amazing unity of design, but in recent years there have been a number of additions to the plaza, and I feel like they’ve messed the place up. Still, the individual buildings are stunning. In nineteen ninety four, Ellerbe Becket Architects supervised some alterations to the Ahmanson, and the end result actually works pretty well. And this is where I ended up, as it was getting close to seven pm. 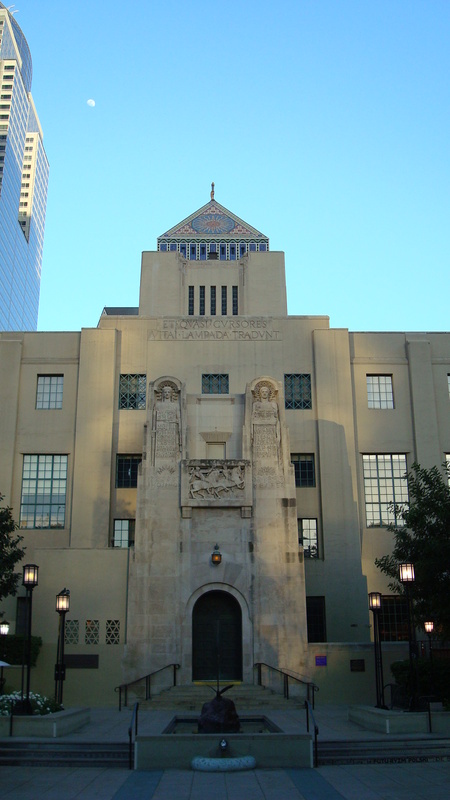 The western entrance to the LA Public Library. I took this photo, then got back on the subway and went home.